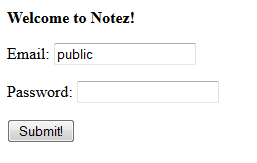 I decided to brush up on my SQL so I've started a simple little notes app that I call 'Notez'. Once I get the web version running the way I want my idea is to make a native iPhone app to access the same database. This way you'll be able to do neat things like add alarms and notifications to notes to remind you about things. It's very simple right now and I have no way for users to create accounts so you can login with email 'public' and no password to try it and see what others have written.